"We absolutely adore Wortley Village. It's our anchor and our 'fort', the feeling we get when we drive over the Horton street bridge is bar none. We feel at home. When we had the house under control (reno reno reno, our heart, blood, sweat and souls have gone into restoring it) We started looking at commercial space for our shop." Considering that neither Aran or Joie were from London, the answer was simple, they needed to be downtown. The structures, the history, the brick everything said - this is where they needed to be. Vanity House is nearly 2,000 long and narrow square feet, one whole side of that is exposed brick. "There is no way anyone could have convinced me to be in a strip mall with these details up for grabs, so we built the shop, fixed everything that needed to be fixed, and set on our way!" "Downtown is changing, I can see it and I can feel it. With surrounding destinations like Budweiser Gardens and the Covent Garden Market, we're spoiled with our locale, but love experiencing everything our core has to offer. The one thing I will say about London, as an outsider, looking in, is that it forgets it's a city. It forgets it could have it's very own identity, it's own niche, it's own personality. We have a downtown, we have all of the beautiful buildings, we're getting high rises, independent businesses, art studios and spaces, clothiers, design firms, excellent food, excellent coffee, you name it and it's here. All within a few blocks." 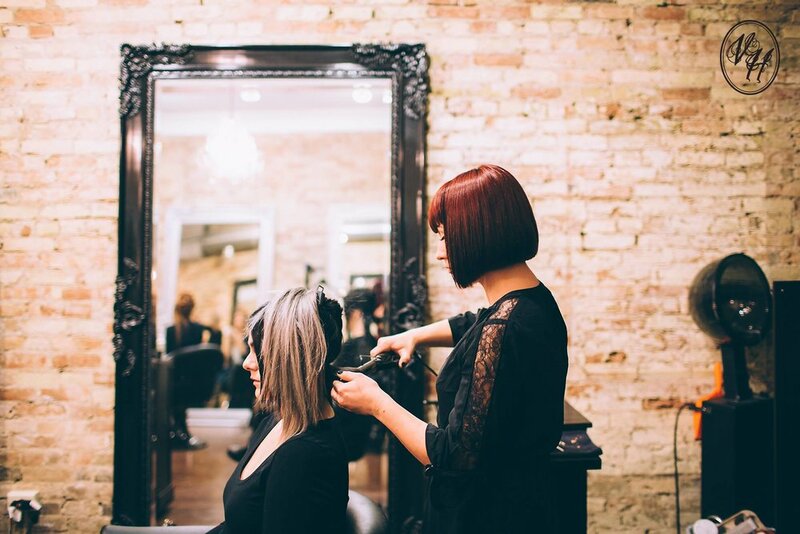 "Here's the best part of our shop - we get to share our space with our beautiful team. We do spend over 50 hours a week together - especially once you factor in morning coffee together and chatting after we're closed - so the personalities had to be right, their skills had to be right, but most importantly they had to be good people. The great part is, all of our guests feel this, they feel us when they walk into the shop. They know they can see anyone here and be happy. No catty, ego filled stylists, just straight up good hair, with good people." "We love it. We couldn't imagine our space and our shop anywhere or way else." Ready to book an appointment? Give them a call at 519-963-0757 or check out their website here. You can also find them all over Facebook and Instagram.